On Friday night, in the first game of the Atlantic Hockey quarterfinal series between Robert Morris and Bentley, the Falcons scored a goal in the final minutes of regulation to tilt a tied game into their favor. 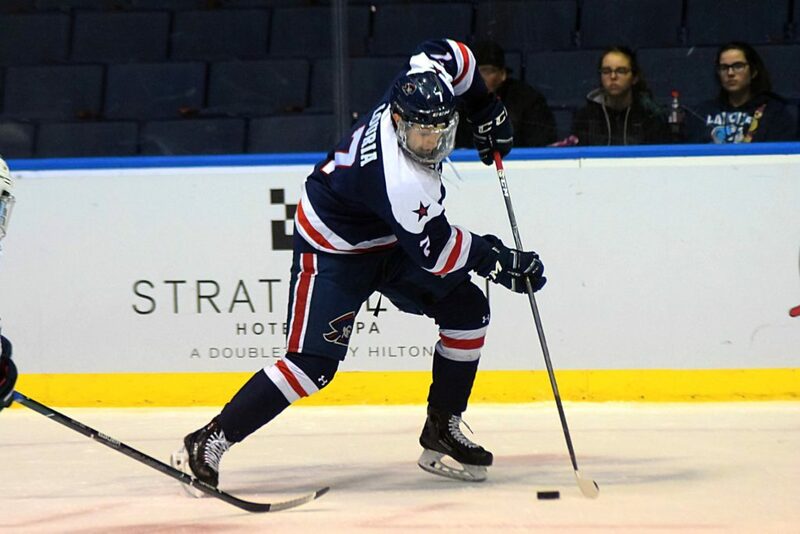 On Saturday night, the Colonials returned that favor, as senior forward Mike Louria scored with 1:25 remaining to lift Robert Morris to a 2-1 victory and even the playoff series at one game apiece. Louria’s winner set up a mutual-elimination Game 3 at Bentley Arena on Sunday afternoon at 4:05 p.m.
Daniel Mantenuto had he lone assist on the goal, and he knew that it would be good as long as his cross-ice pass found its way to Louria’s tape. The goal broke a game-long logjam at even strength, where both teams had trouble generating offense, particularly as the game went on. After combining for 27 shots in the first period, the squads combined for just 32 the rest of the way, with RMU holding the narrowest of advantages at 31-29. Where the teams did find offense was on the power play. The Falcons got the first opportunity, and struck paydirt early on. With Alex Tonge off for hooking 47 seconds into the contest, Alexey Solovyev took a feed from Connor Brassard and fired it towards the net, where Jake Kauppila deflected it past Francis Marotte to give Bentley an early lead. The Falcons got four more power play chances n the first period, but it was Robert Morris that got the next best scoring chance when Luke Lynch tried to stuff a puck past Aidan Pelino. Lynch celebrated as if he’d scored, but the puck was deemed not to have crossed the line after video review. Just 29 seconds into the second period, Bentley’s Brendan Hamlblet was sent off for tripping and Robert Morris defenseman Eric Israel took advantage, firing the rebound of a Louria attempt past Pelino to knot the game at 1-1. That was the Colonials’ final chance at a man advantage, but they had to kill off two more minors in the second period, finishing the night 5 of 6 on the penalty kill. The game-winning goal was Louria’s ninth of the season, and the first time all year he scored goals in back-to-back games. It was also just the fourth multi-point game for the senior, who is set to wrap he second and final season with the Colonials. He played two seasons at UMass-Lowell and sat out 2016-17 due to NCAA transfer rules.